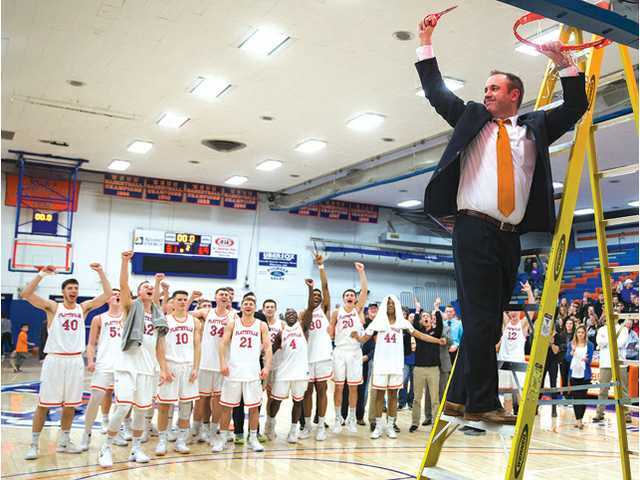 UW–Platteville head coach Jeff Gard cuts down the net with his team looking on following Saturday night’s 81–69 victory over UW–River Falls that clinched the WIAC title. POSTED February 21, 2018 2:01 p.m.
PLATTEVILLE — The Wisconsin Intercollegiate Athletic Conference has one of the nation’s richest basketball histories, with national champions, All-Americans and future NBA players. Among all that glorious history, however, no team had ever gone from last place one year to first the next. On Saturday night, UW–Platteville put its name in the record books by accomplishing that historic feat. The Pioneers beat UW–River Falls 81–69 on Bo Ryan Court and claimed their first conference championship since 2005 and, coupled with UW–Stevens Point’s loss at UW–Eau Claire, their first outright crown since 1999. A year after going 1–13 in the league, UW–Platteville improved to 22–3 overall and 12–2 in the WIAC in the regular-season finale. Earning a first-round bye, the sixth-ranked Pioneers will play host to a WIAC semifinal game Friday at 7 p.m. Tickets will go on sale Tuesday morning in Williams Fieldhouse. The matchup will be determined after Wednesday night’s first round. The Pioneers stretched the lead to as many as 30 at 57–27 before the Falcons finally found their shots again, hitting 10 three-pointers to make the score closer. Robert Duax led the Pioneers with 19 points, while Carter Voelker had 17, Matt Oestreich 16 and Quentin Shields 11. Alex Herink led the Falcons (16–8, 7–7) with 18 points, Matthew Timlin scored 11, and Jalen Greenlee had 10. The WIAC title is the 20th for UW–Platteville, which won four NCAA titles in the 1990s. “It’s great to bring that tradition back to Platteville,” said Showalter. UW–Platteville fended off UW-Whitewater (16–8, 6–7) Wednesday night on Bo Ryan Court coming away with a 70–66 win. The Pioneers started the second half with a 39–27 advantage, but the Warhawks slowly chipped into the lead over the next 19 minutes. Trailing 66–61 with 2:05 left in the game, the Warhawks’ Andre Brown converted on an and-one opportunity. On their next possession UW–Whitewater’s David Sachs hit a jumper to tie the game at 66-66 with 1:19 remaining. On the Pioneers’ next possession Voelker hit one of two free throws to put the score back in UWP’s favor. UW–Whitewater was unable to convert on their next two possessions, and the Pioneers hit three of four free throws down the stretch for the 70-66 win. Showalter finished with 16 points, connecting four times from beyond the arc. Robert Duax had 14 for the Pioneers, and has now scored in double digits in 13 of UW–Platteville’s last 14 games. Voelker played in 39 of 40 minutes for the Pioneers, contributing 10 points and six rebounds. UW–Whitewater (16–8, 6–7) — David Sachs 11, Andre Brown 16, Dalton Menke 8, Derek Rongstad 3, Riley Jensen 13, Mitchell Pfeifer 8, Maurquis Turner 7. Totals — 25-50 11-14 66. UW–Platteville (21–3, 11–2) — Jake Showalter 16, Matt Oestreich 9, Robert Duax 14, Carter Voelker 10, Clay Gerds 8, Alex Ranney 3, Quentin Shields 7, Trey Sigel 3. Totals — 22-46 16-19 87. 3-point goals — WW: 5 (Sachs 1, Brown 1, Menke 2, Rongstad 1), P: 10 (Showalter 4, Duax 1, Voelker 1, Gerds 1, Ranney 1, Shields 1, Sigel 1). Team fouls — WW: 17; P: 17. Fouled out — none. UW–River Falls (16–8, 7–7) — Clay Seifert 4, Alex Herink 18, Matt Keller 4, Brennan Witt 9, Jalen Greenlee 10, Isaac Castellano 3, Matthew Timlin 11, Chris Laymon 2, Austin Heidecker 6, Julian Jackson 2. Totals — 21-61 17-25 69. UW–Platteville (22–3, 12–2) — Matt Oestreich 16, Harold Fay 2, Dan Lowe 2, Alex Ranney 2, Quentin Shields 11, Robert Duax 19, Carter Voelker 17, Justin Stovall 5, Clay Gerds 7. Totals — 25-59 25-31 81. 3-point goals — RF: 10 (Seifert 1, Herink 3, Greenlee 2, Castellano 1, Timlin 3), P: 6 (Osetreich 1, Voelker 4, Gerds 1). Team fouls — RF: 26; P: 19. Fouled out — none.